When it comes to keeping it real, Jessie James Decker is queen. The mom-of-three and country superstar doesn’t just do it all. She documents it for all to see! Whether it’s highlighting her most recent vacation getaway with her hubby, former NFL star Eric Decker, or whipping up a batch of her fan-favorite famous chocolate chip cookies, Decker’s Instagram is the ultimate destination for serious inspiration. So while we may learn a thing or two about baking or awesome travel destinations, we can also get some fashion inspiration, too! The singer proved that this old school sneaker is still fresh since she’s been wearing it a ton lately! See it: Grab the Skechers Sport Women’s D’Lites Slip-On Mule Sneaker with prices starting at $33, available at Amazon! Please note, prices are accurate at the date of publication, March 19th, 2019, but are subject to change. Don’t call it a comeback, this sneaker has already been here. But let’s make no mistake, thanks to JJD’s stamp of approval, this Skechers sneaker is here to stay. 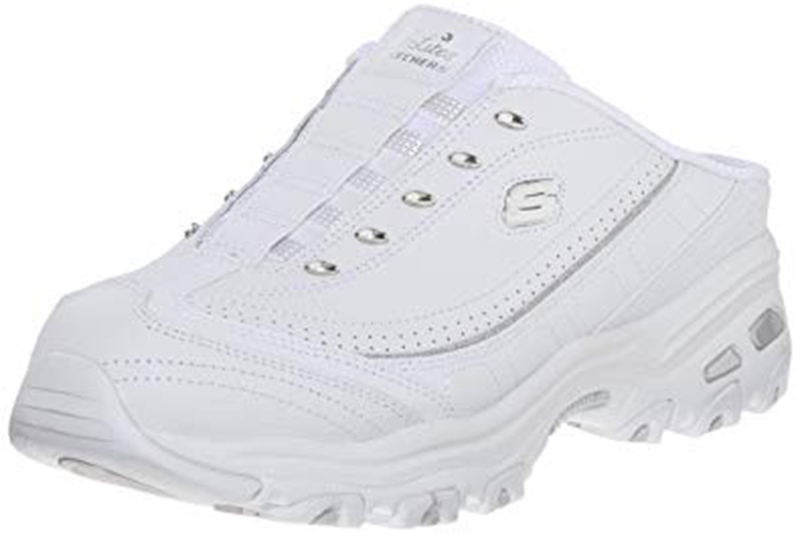 The Skechers Sport Women’s D’Lites Slip-On Mule Sneaker is the fan-favorite option that has taken Amazon by storm. With nearly 2,700 reviewers singing its praises, it’s safe to say this sneaker is nothing short of a cult classic. And since we’re already on the subject of classics, this sneaker’s classic slip-on design is the ideal option when looking for a subtle but sophisticated style. The lightweight 100% smooth leather and synthetic silhouette features a rubber sole and platform heel. The air-cooled memory foam insole inside doesn’t just make this option cool, but actually makes it cool, working overtime to keep this sneaker light and breezy. Call it the ultimate two-in-one option. Thanks to the sneaker-mule combination, it’s the most wearable business in the front, party in the back option in footwear. That’s right, it’s a true two-for-one. The front section of the shoe very much resembles a traditional sneaker. Think bulky-toe areas, laces and endless support. But this option offers an exposed open-back, mule-like silhouette in the back. It’s equal parts sleek and sophisticated as well as comfortable and chic. It’s no wonder why so many reviewers couldn’t help but jump on the bandwagon. With nearly 2,700 fans, shoppers loved the cushion, comfort and chic elements this sneaker had to offer. Go ahead and call it the perfect trifecta. One reviewer even went ahead and boldly said this Skechers slip-on sneaker offered a slipper-like component. Strange enough, we agree! The memory foam insole is the perfect footbed. This sneaker is obviously the best choice for on-the-go! In fact, it’s a no-brainer why Decker is such an avid supporter of this fresh kick. As not only a mom-on-the-go but a superstar-on-the-go, a comfortable shoe that serves support and style is essential. The proof is in the photo as to why the Eric & Jessie: Game On star keeps her game on point in this slick sneaker. As seen in her March 9 post on Instagram, the singer’s entire look remains fresher than fresh in this style. (P.S. 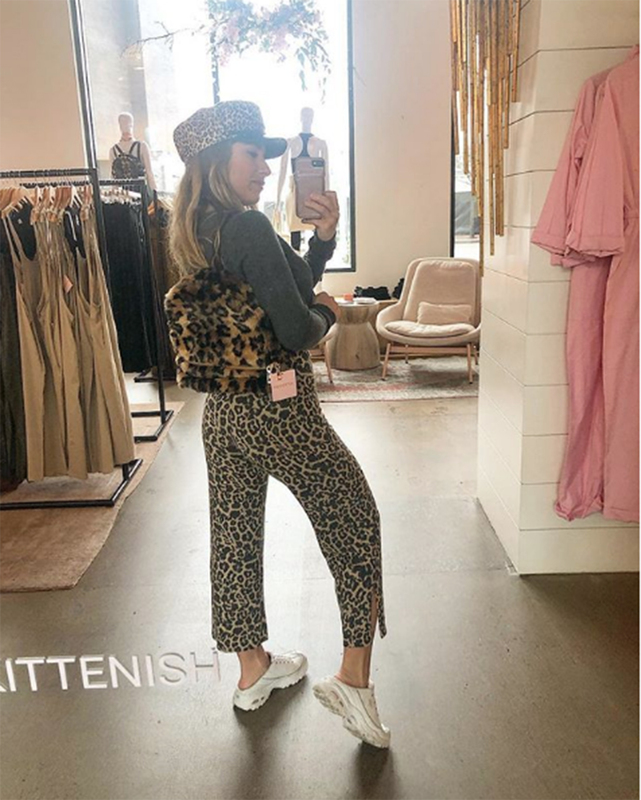 We also spotted Decker in her favorite kicks in this February Instagram post, too!) It’s so chic, we can’t help but want to mimic JJD’s effortless ensemble, too! Start off styling this look by sliding into these slides along with a pair of equally stylish trouser pants. A bold color or bright print will catch attention, just like Decker did! That’s why we second the leopard-print motion JJD is championing with a matching leopard print bag and hat! Keep the look balanced by reaching for a solid long or short sleeve T-shirt. If too much animal print, opt for just one printed piece and keep the rest of the look solid and simple! This fresh kick will easily transition from cooler to warmer weather just as seamlessly. In fact, with a total resurgence of all things ’90s on the up-and-up, we can’t think of a shoe more ’90s than Skechers. This slip-on is also perfect when paired with all of those supershort minidresses, midi-dresses and even those flared, cropped bottom jeans. Thanks to Mrs. Decker, this sneaker-mule option is the seriously stylish sneaker mule that will not only kick up our style but get Us extra points for its “wow” factor. See it: Grab the Skechers Sport Women’s D’Lites Slip-On Mule Sneaker with prices starting at $33, available at Amazon! Please note, prices are accurate at the date of publication, March 19th, 2019, but are subject to change. Not your style? Check out additional sneaker options also available at Amazon here!